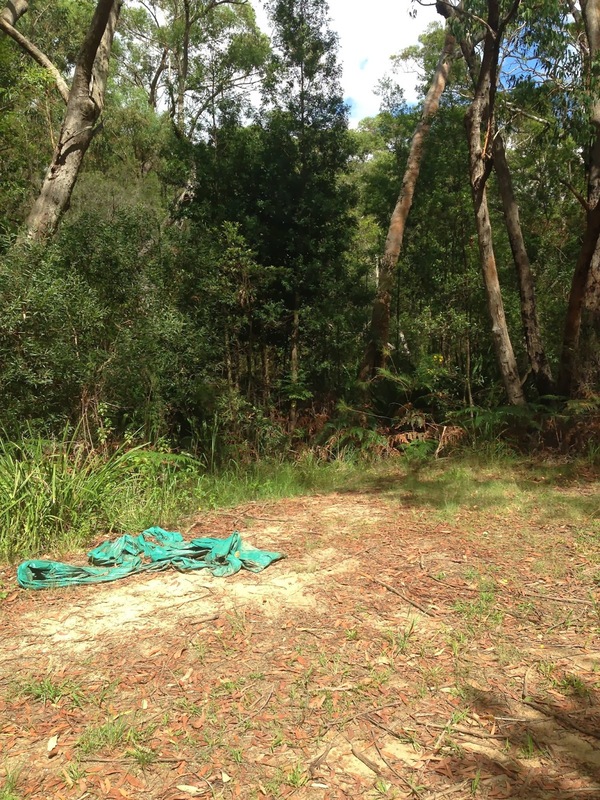 We are very fortunate in the Sutherland Shire as there are plenty of bushy places we can take our dogs. I mentioned the Woronora pipeline in the post about the Needles. The pipeline is generally a reliable starting place for lots of bushy adventures with dogs. At the northern end of the pipeline, there is a section between Woronora and Woronora Heights/Yarrawarah that goes through a nice little patch of bush surrounding Forbes Creek. There is a surprising network of narrow mountain bike tracks east of the creek, and the pipeline is on the western side. I have prepared a map with a loop walk using the large access track alongside the pipeline and then into the bike trails. Don't worry too much about following the correct bike trail. I think most of them join up eventually. 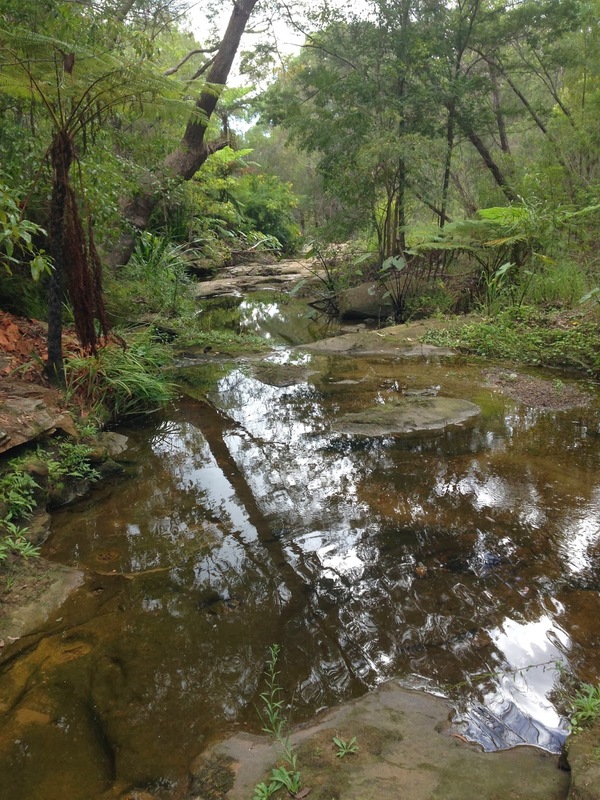 A loop walk around Forbes Creek, Woronora. 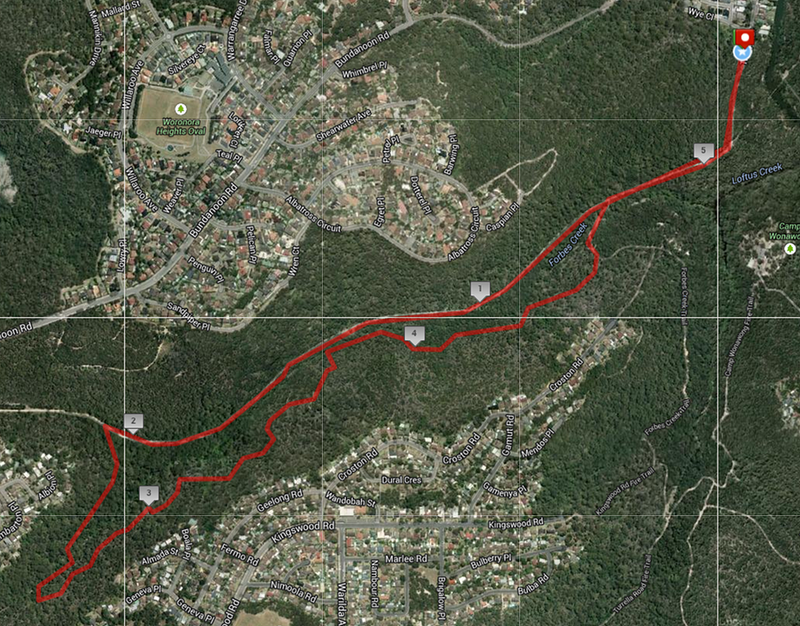 Access the pipeline in this section either from the end of Thorp Rd in Woronora or Bundanoon Rd in Woronora Heights. The pipeline access road is easily visible on Google Maps. We come the Woronora end and walk up alongside the pipeline. We turn off the pipeline road close to Bundanoon Rd. The track is small and difficult to see. Check the photo below for what it looks like where it joins the pipeline track. The trail leaving the pipeline road is hard to see. Follow the narrow bike track down to Forbes Creek and look for the track on the other side. It goes both ways along the creek, but turn to the right and follow it south. There will be a few more branches. Go right again, then left to curve around up higher above the creek and it will double back and head north. Eventually it will wind down towards the creek again. There are more branches around this area, but they all end up in much the same place. You will come out at the creek, then go up the hill a little ways again and eventually end up on a large fire trail. Follow it down the hill where there is a bridge across Forbes Creek, and then you will be back on the pipeline track. Forbes Creek crossing on bike trail. This patch of bush is not huge, but certainly big enough for a good wander. The loop walk on the map is about 5.4km long and takes about 1 1/2-2 hours if you take it at a leisurely pace. As with most bushy areas, there are snakes here. There are also bikes. If you visit on a nice, sunny weekend you will probably see one or two bikes. The bike trails are narrow and winding and you may not get a lot of warning before they arrive. There are also a few wooden structures that give bikes purchase on steep, slippery slopes and keep them off muddy areas. These are not dog friendly, as there are gaps between the wood slats that paws can fall into. There are ways around, though. There are some short sections that are very steep and a bit loose. The dogs will cope fine, but people will need to be steady on their feet and wearing shoes with decent grip. Be aware that when it has rained, the soil here has a lot of clay in it and can become extremely slick and treacherous in places. The pipeline road is all right, but around the bridge across Forbes Creek it can get pretty slippery. Forbes Creek itself can also get quite swollen after rain. Crossing it might require gumboots and carrying small dogs. 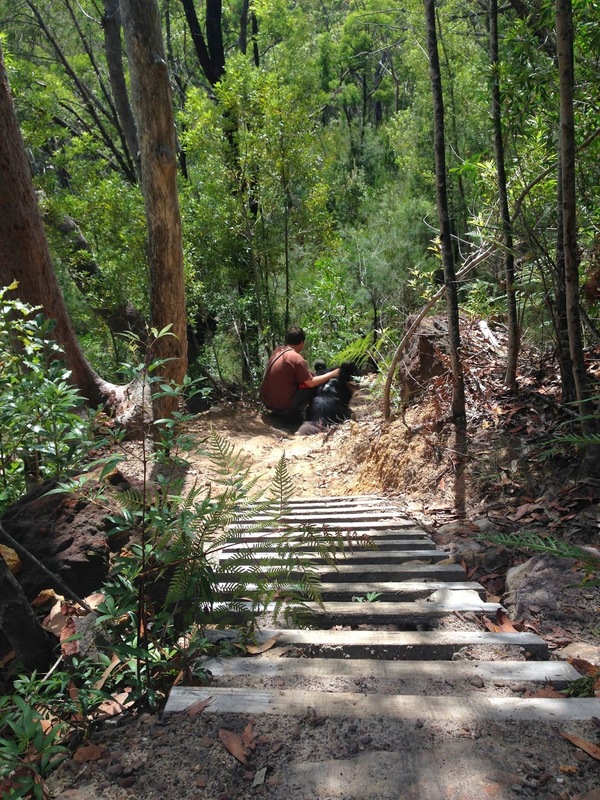 Steep, loose sections and mountain bike wooden structures can be tricky for dogs and people. Dogs are supposed to be on leash. We rarely see other dogs and their owners in this area. If you do see other dogs, it is likely they will not be on leash and they may not be friendly. However, we have only ever seen dogs on the pipeline road and there is plenty of room there to keep clear of other dogs. We are very fortunate to be able to walk our dogs in these bushy areas. Please show your gratitude by cleaning up after your dogs and minimising their impact on the environment. As well as the odd snake, there are also sometimes wallabies and water dragons in this area, and we have seen echidnas nearby. The birdlife is also quite healthy. Keep your dogs close and under control so they don't harass the wildlife. Negative Reinforcement - Is it ethical?